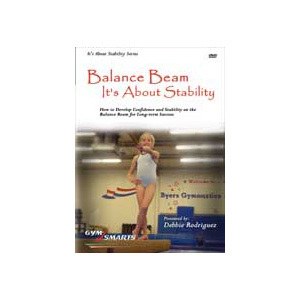 Unique training techniques and philosophy that have helped gymnasts of all levels improve and enjoy more success and satisfaction working on the beam. Whether you are a recreational gymnast or a high level international competitor, the balance beam is almost always more enjoyable if you stay on, don't wobble or fall off. 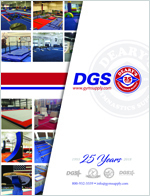 In this DVD, Debbie Rodriquez gives her unique training techniques and philosophy that have helped gymnasts of all levels improve and enjoy more success and satisfaction working on the beam. Using her background as a Physical Therapist, combining that with her gymnastics experience as international competitor and her many coaching successes, she explains exactly how she works with girls to increase their stability and confidence on the beam. You will see her working with some of her young hotshot gymnasts performing several drills and exercises and critiques how they are performing these skills. These skills can be performed on any line, low beam or high beam and will help gymnasts of all levels. With over 30 years of gymnastics experience as gymnast, Canadian Elite Gymnast, Collegiate Athlete, Coach and Club Owner, Debbie Rodriguez is recognized as a leader in the gymnastics community. She coaches all levels of gymnastics from beginners to elite athletes.